Here in the Washington region we have experienced record snowfall that has crippled our transportation systems. They are returning to normal. At the time of this post, it is eight days since the blizzard ended. I live in Arlington County, which is supposedly the model TOD community: bicycle and pedestrian friendly, excellent transit service, smart land-use decisions, etc. At bicycle advocacy meetings I hear that we are going to strive to move up from Silver to Gold designation from the League of American Bicyclists. However, not one flake of snow (now ice) has been removed from any of the key (and in some cases essential) ped/bike commuter corridors. This part of the Custis Trail (which is likely one of the 10 most used bike commuter routes in America) has been redubbed the Custis luge. Because of how it is shaded, it will still have ice on it a month from now unless action is taken. without a car, because of all their supposed amenities and  infrastructure. Yet  someone who lives in parts of Rosslyn  without a car has no--zero!--options for getting to the Metro (okay, taxicab; one). What are they to do? Walk on Lee Highway? Risk injury on the Custis luge? There are three sections of trail near Metro stations that provide Metro access to hundreds and hundreds of people. As of the time of this writing, not one inch of those sections has been attended to in any way. Because of the significant pedestrian use, those sections have now become glaciated skidways of treacherous ice. The problem is that trail maintenance is housed in the Parks Department. Rightfully, Parks tend to have lower priority than transportation. Yet in the case of significant portions of Arlington trails, they function primarily as transportation facilities. Trails that are used significantly for transportation should be treated as transportation infrastructure and prioritized as such. Recently Arlington installed counters along the trails, and they have documented the fact that a significant number of people are using the 4-Mile Run underpass at 395 for transportation; it's necessary for them to reach jobs in Shirlington. Yet as far as the County is concerned, they may as well not exist. If someone were to try to clear the Rosslyn part of the Custis now, it will take many hours and big-time treatment, costing thousands of dollars. Clearing all the trails would take days. I can hear the whine already, "We doe-on't have the muh-uhny to do it." 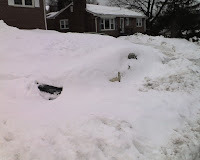 A few years ago I was in New York a couple of days after a large snowstorm. I stayed on the west side near Ground Zero. I could see the Hudson River Greenway totally cleared as far as I could see, and one cyclist I talked to said it was cleared all the way up. The streets were still a mess. Somehow NY has figured out a way to prioritize that route for the thousands of peds and cyclists who are dependent on it. When the George Washington and Rock Creek Parkways were built, they were primarily envisaged as "recreational" facilities--intended for people to tool along and enjoy the scenery. Their function has changed. Imagine if commuters were told that those roads were not going to be cleared, because they are "Parkways" rather than "highways," so they are not really transportation corridors, but recreational. That's essentially what pedestrians and cyclists are being told about their "trails." They are recreational facilities, not transportation corridors, so they don't get tended to until everything else is done, and then only if there is money enough left. It is past time for communities to re-prioritize their thinking about transportation to include all the amenities, not just the roads and transit facilities. Pedestrian and trail facilities should be included in transportation budgets--not parks or other lower priority budgets. To be fair, how much snow does NYC typically get as compared to DC? They have the need for such snowclearing abilities. We don't. As you indicated in the beginning, this is a historic snowfall, and it's taking time to dig everyone out (note that there are still several side streets and subdivisions with snow on them). Should the focus include the major bike routes now? Absolutely. Should the bike routes have been targeted at the beginning? I say no. Top priority needs to be with the major routes...both for getting supplies into/through the region and for emergency personnel. IMO, all three main jurisdictions failed on this one. Once the main roads are cleared and the jurisdictions move on to the secondaries, that is the time to include the bike routes. All that is done, and there is no indication they will get to the bike/ped trails. 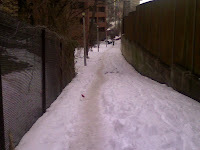 There also needs to be accountability for property owners who don't clear adjacent sidewalks. I saw children walking by themselves in a traffic lane on Columbia Pike because sidewalks weren't cleared. I had to walk in the street to get to the bus because many of my neighbors didn't clear their sidewalks (although they managed to find the time to clear their driveways for their own benefit). Does Arlington issue a fine if sidewalks aren't cleared? Arlington does not. Both Alexandria and Falls Church can levy fines for not clearing. I don't know if they ever enforce, however.